A quick update of the chart I first presented last June, and in an updated version last August. 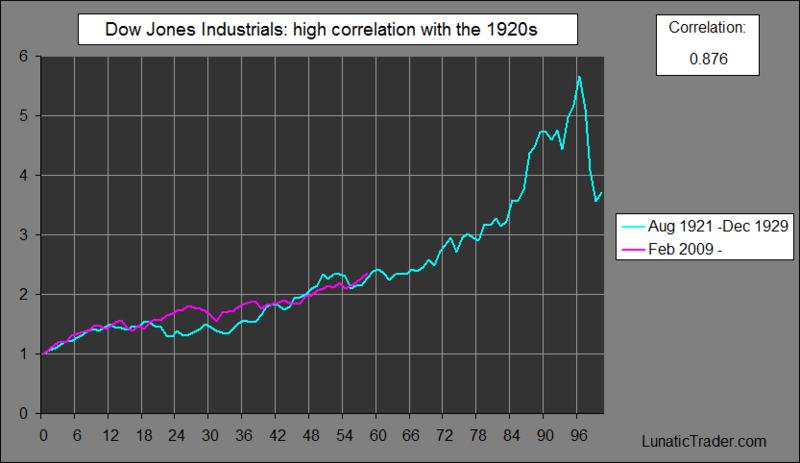 Not only that, the level of the Dow Jones Industrials is almost exactly where it was at this stage in the 1920s. If it continues this way, then the market will go through a shallow correction with a summer bottom and then recover by the end of the year before bursting higher in 2015 and 2016. At that point it will be too late for the central banks to stop the disaster. This is the danger of “perpetual” zero interest rates: it makes bonds completely unattractive to hold for the long term, so too much money starts flowing into stocks and it becomes like a runaway train. P/E levels can easily reach 25 or 30 before everything is said and done. What could be done to stop it? Stop QE before the summer and raise short term interest rates to 2% or more. This will probably cause the stock market to drop to 12000 or even 10000, but that’s better than setting up for a repeat of the 1930s. This entry was posted on January 14, 2014 at 11:41 am	and is filed under Market Commentary. Tagged: 1920s, Dow Jones Industrial Average. You can follow any responses to this entry through the RSS 2.0 feed. You can leave a response, or trackback from your own site. So the pink line is now only at 1925. The chart is based on monthly closing prices. The Dow bottomed in August 1921, after a 50% decline in the market. The turquoise line shows August 1921 until Dec 1929. Recently the Dow bottomed in February 2009, after an equally serious deflationary decline. The purple line shows the evolution in the Dow from February 2009 until now. You can see it matches quite closely, an 88% correlation over almost 5 years. We are now 58 months into this bull market, so December 2013 corresponds to June 1926 in this comparison. I wonder if my friend John has seen this? Basically the bull market continues as long as the main alternatives for stocks (say bonds and real estate) are not looking good. Bonds are set for a drop when zero interest rate policies are stopped, so somebody who is thinking to sell out of his stocks today, where is he going to put the money? Buy bonds? Sit in cash? Buy a second home? Invest in collectibles? The manipulation of interest rates has dangerous side effects, one of them being that stocks can go to abnormally high p/e levels, setting them up for a big crash later on. Once long term bonds yield 5 or 6% again, they become more attractive versus stocks, and that’s when the money suddenly starts flowing out of (by then expensive) stocks and into bonds. There is a logical connection between long term interest rates and p/e levels. That’s why you typically get the so-called multiple expansion when interest rates are kept near zero for years, with promises to keep them near zero for several more years. Your correlation analysis for the future is looking good. Interest rates are a primary driving factor. Don’t forget to include the capital flow from Europe. The EURO and the EU are a disaster and will cause EU money to flee and seek a safer have. That’s a lot of money. That haven will likely be US and some Asian markets. The haven that will win in the end will be the one that has a government that taxes and confiscates least and at the same time provides confidence of security of money and well being. Right. Interest rates and their expected evolution determine how attractive stocks are versus bonds. When interest rates are as low as they can get, bonds are as unattractive as they can get. Money flows can play a role. But the EU has a growing trade surplus, mainly because imports are so weak. Also, the investor’s money that flees the EU disaster probably already did so in 2011 or 2012. That’s why the euro has been rising recently. Capital flows are rather hard to forecast, because they depend on things like exchange rates and recent stock market performance in various parts of the world. I think the euro has further to rise and that will make certain problems in the EU zone worse. What does the magenta line mean? Magenta line is the performance of the Dow Jones index since February 2009, the start of the current bull market.